Recently I’ve recieved quite the influx of postcards, to the point that I don’t even manage to send out thank yous before more arrive! It’s like Harry Potter getting his letter from Hogwarts, except with much less owls. And because they’re all so beautiful and make me happy to look at, I’ve decided to dedicate a wall in my kitchen to these lurvley thoughts and words from around the world. Up there we have Val (three new ones from Malaysia, Tokyo, and Bali!! ), one from FR and her stop in London (so exciting! ), two from my mom (from back home in Montreal of colourful prints of famous paintings), and one from my sister (also from Montreal, and borrowing one of my mom’s art postcards to draw a moustache). Thanks so much, guys! Getting all those really brightens my day. 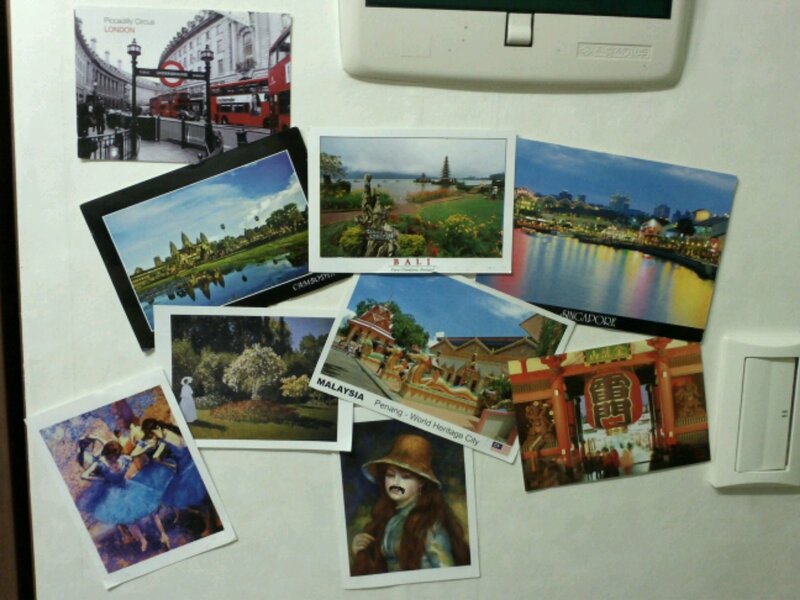 Imagine a complete wall of postcards! That would be cool! Let’s make this happen!!! !